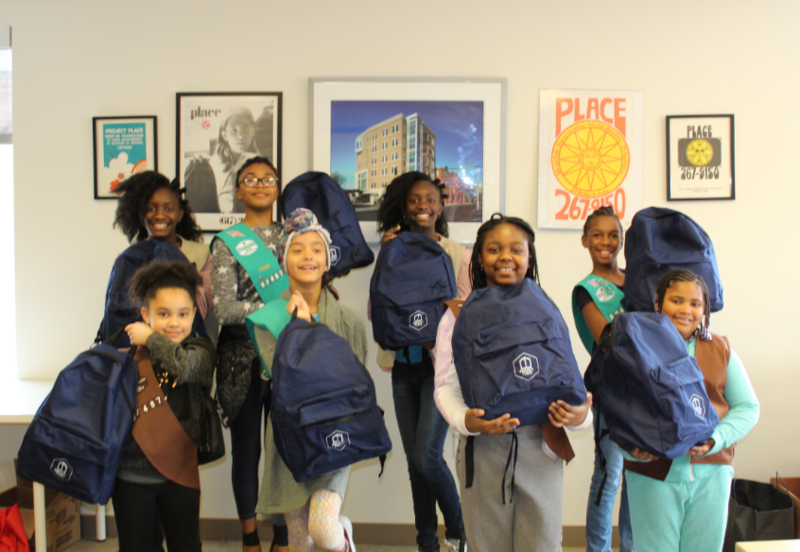 Project Place was happy to have local Girl Scout Troop 82487 (aka The Daring Divas) help us assemble NavSacks for our reentry program. The goal of our NavSack project is to help individuals immediately after they are released from jail. Project Place intervenes in the reentry process, pre and post release, in order to provide support as individuals start to rebuild their lives. We partner with the Suffolk County House of Corrections (SCHoC) and local halfway houses to develop resources to ease the transition back into the community. Our NavSacks reinforce the connections we have made with those in the SCHoC and halfway houses and helps these individuals maintain a sense of dignity and hope as they navigate next steps. The girl scout troop filled 25 NavSacks with resource materials such as brochures, maps and Charlie Cards, as well as personal-care essentials, such as snacks, reusable water bottles, socks and underwear, hairbrushes, toothbrushes and toothpaste, deodorant, soap, and more. The girls then created colorful cards with positive messages to offer hope and encouragement to individuals during this time of transition. Saturday’s volunteer day also incorporated an educational component. Molly Marshall and Ashley Newman, two case-managers/instructors, from our Community Reentry for Women program (CREW), facilitated a conversation about incarceration and reentry and explained Project Place’s services and programming. The girls engaged in a very thoughtful dialogue about the emotions someone might be feeling upon release and asked many questions to learn more about how we are able to help someone find their second chance in life. We are so grateful for the community support we have received towards this project. Thank you to our young volunteers who show us what dedication and care for our community looks like in action. Thank you to all our donors who contributed to our fundraiser and thank you to the Commonwealth Care Alliance and the South End residents who gave generous in-kind donations to support our work. Last, but certainly not least, thank you to Rose Lovett, Project Place’s development coordinator, for putting this all together.